Robbie's Automotive Service, an auto repair center serving the San Jose area, is currently offering customer rebates, while supplies last. Robbie's Automotive Service, offering auto, engine and brake service in San Jose, announces the availability of customer rebates coupon books. The promotion will last until either Aug. 31 or the supplies run out. The first rebate is a Monroe Shocks and Struts coupon that features a buy three, get one free promotion. The coupon applies when customers purchase four qualifying Monroe Reflex or Monroe Sensa-Trac Shocks or Struts; four Gas-Magnum Shocks; four Monroe OESpectrum Shocks or Struts; or any four Rancho RS9000XL, Rancho RS5000 or Rancho quickLIFT shocks. “These days, every penny counts. This promotion offers a great rebate that saves money on the cost of one unit,” Saul Carlos of Robbie's Automotive Service said. "The rebate applies to the lowest cost unit." When purchasing two Monroe Quick-Strut Replacement Assemblies, the next rebate offers customers a $75 rebate check. A customer who purchases two Monroe Sensa-Trac, Monroe OESpectrum or Monroe Reflex Struts and two Monroe Strut-Mate Mounting Kits will receive a $50 rebate check. Lastly, customers purchasing one Walker Quiet-FlowSS Muffler or Welded Muffler Assembly, one Walker Direct-Fit Catalytic Converter or one Walker CalCat Catalytic Converter will get a $50 rebate check. Robbie’s Automotive services all vehicle types, including cars, trucks, SUVs and vans. Robbie’s Automotive also offers comprehensive, guaranteed service for any vehicle at competitive prices. For more information about the current rebate promotion or Robbie’s Automotive Service, call 408-514-5281, view the auto repair center on the web at http://www.engineandautorepairsanjoseca.com/ or visit 382 Race St. in San Jose. 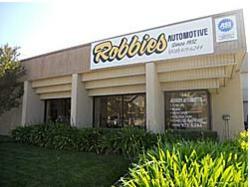 Since 1932, Robbie’s Automotive Service has provided exceptional auto repair services to San Jose and South Bay residents. Whether a car is in need of a simple brake service or comprehensive engine repair, Robbie's Automotive Service’s team of ASE Certified, professionally trained mechanics will provide prompt, friendly and precise service for any vehicle. Robbie's Automotive Service can perform the same preventative maintenance services as any dealership.